Here are the next 10 charity quilts I wanted to show you! Technically, at 10 quilts per month, these are October's quilts. :) I'm ahead. Whew. After operating behind for so long, it feels good to be ahead. I like to take a picture of the pile of ten quilts before I actually take them outside to get their pictures. Here they are - individually! The last three pictured here are somewhat bigger than the others. But I'm grateful for all of them! Someone sent me the blue one with the colorful pieces in it. At first I thought it was supposed to be a backing, but upon further inspection, I opted to make it a cool looking quilt. Here is the what it looks like with these 10 added to the pile at the church building. 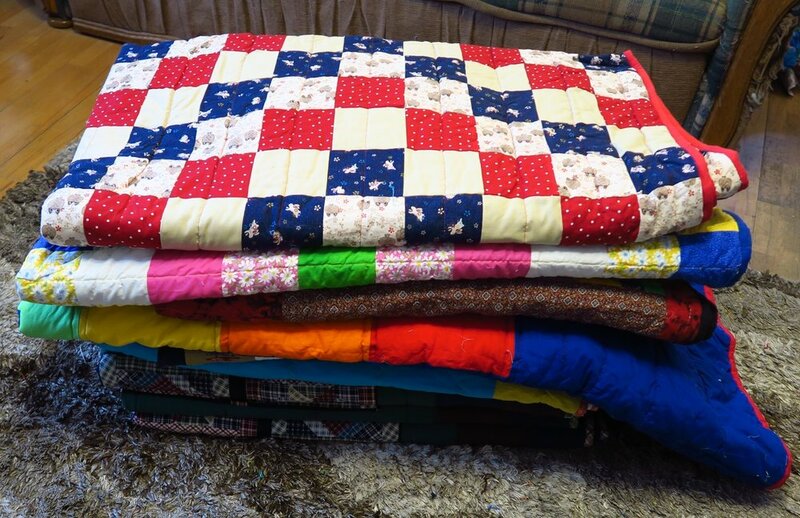 With the 100 I've recently added plus the 50 I had before, there are approximately 150 quilts here. The pile straight ahead is the one I thought of as for ladies/teen girls or couples, the pile to the far right primarily for men (but women might like them as well) and the middle two piles are children's. Make sure you check out what my sis has for you over in the store! I'm sure she has something you can use!